To lose to a quality opponent at home, with just seconds to play in the game, right after a dramatic go-ahead sequence sends a full-throated sold-out crowd into a frenzy is no easy pill to swallow. From this truth the 76ers did not run Saturday, following a narrow 117-115 loss to the Oklahoma City Thunder. 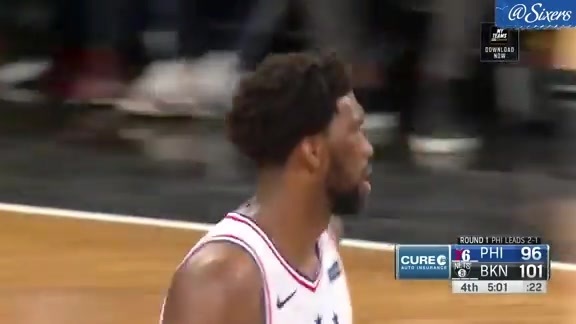 But the tone Brett Brown went on to strike in the immediate aftermath of the game stood out, and jogged memories of a similar situation from the past. • Russell Westbrook fouled Joel Embiid on a 3-point attempt, giving Westbrook his sixth foul, and resulting in his disqualification from the game. • Embiid proceeded to even the score on free throws, 113-113, with 14.9 seconds to play. • On Oklahoma City’s inbounds play, the Sixers trapped Dennis Schroder on the sideline, which set up Jimmy Butler to steal Schroder’s crosscourt pass at the timeline. • Butler bolted the other way for a tie-breaking lay-up, 115-113, with 6.9 seconds to go. • Butler then fouled Paul George on a 3-point attempt on the Thunder’s ensuing possession. The successful four-point play with 5.1 seconds left decided the game. The twisting, turning chain of events wasn’t for the faint of heart. “At the moment, it’s a tough loss,” Brown said about 15 minutes after the final buzzer cruelly sounded. “We had it,” said Embiid, who, with 31 points, matched George for game-high scoring honors (Embiid also recorded eight rebounds and six assists to finish with a plus-15 rating). While disappointment may have been fresh on the tongues of Brown and some of his players, it would be a mistake to confuse those feelings for discouragement. There was none to be found. The stinging way the Sixers lost Saturday to Oklahoma City, and how Brown subsequently framed the outcome in a positive, forward-looking fashion brought to mind the 2017-18 season-opener against Washington. Then entirely unproven, the Sixers managed to claw within a possession of the Wizards with a minute to play, doing so on the road, no less. Washington would prevail, but Brown was mostly focused on the big picture. Of course, Brown knew that with 81 games remaining, there was more for the Sixers to do. On that particular evening, though, he had an auspicious hunch about the long-term prospects of his group, and it turned out to be spot on. The Sixers would ultimately gel, find their way, and go on to enjoy a spectacular season. To bring things full circle, some of the themes that Brown alluded to Saturday were awfully similar to ones he expressed on opening night 2017 (at least to these ears they were). Would Brown have rather beaten Oklahoma City than lost? You bet. But even in defeat, Brown, like he’s done many times before during his six-year tenure, again found cause for optimism. It’s a message that already appears to be resonating. Take it from one of Brown's key players. So too did the Sixers. At this stage of their development, they just came up a few good possessions short.